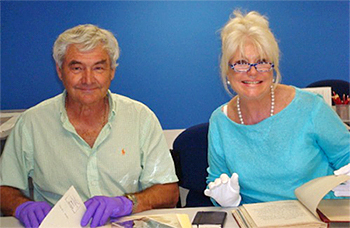 When Di Morrissey and her companion Boris Janijc visited the Northern Territory Archives Service (NTAS), she was in search of a journal, any journal, which had been kept during an expedition. Ideally she was looking for an expedition which had occurred during the 1950s by a film crew, but she settled for a couple of examples of diaries although they did not quite fit this description. Although Di was in the process of writing a novel and already had her story mapped out, she was interested in the process of researching and retrieving archives, and she does describe this in some detail in her novel “Silent Country”. In the few months following her visit Di sent regular emails to reference staff at the NTAS, seeking to understand where the main character in her novel, a journalist, would be looking for certain categories of information in the context of the Northern Territory (NT). In Di Morrisey’s story, archives are described as a place of excitement, a place where crucial discoveries are made. The archivist in the novel is named Collette. She is softly spoken and adopts her client’s quest as her own: “I am as interested as you are now to find out what happened,” says Collette. This will resonate with many archives and libraries staff engaged in reference work. Apart from describing the process of accessing archives Di also promotes the role of the archives. Veronica, the main character and a journalist asks Collette if she would agree to be filmed. As the plot unfolds Veronica goes on to use the “Death Files” which are police records about police inquests into deaths. Veronica also visits the library in numerous occasions. Toward the end of the book Veronica has befriended Collette the archivist and they go on outings together.